Instant warmth and comfort leave time for the important things in your life. Meridian series gas fireplaces come alive as flames swirl around split logs. 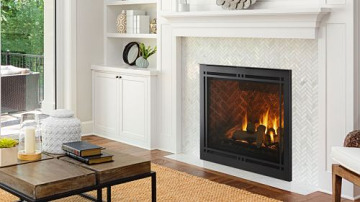 A crisp and clean interior makes these fireplaces inviting, whether they're burning or not. Easily customize your Meridian series and for more ambiance and bigger flames. Includes: Meridian Platinum Top/Rear direct vent, black contemporary rectangular door with 36" overlap front, 8 ceramic fiber logs, glowing embers, manual gas shut off valve, gas flex connector, junction box, battery backup and control wire. Viewing Area: 32" x 21.56"